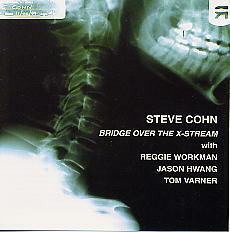 Recorded live at the Knitting Factory in January 1999, this band of top New York musicians performs six compositions by Steve Cohn. Reggie Workman is on bass, Jason Hwang on violin and Tom Varner on French horn; and the leader of the group, Cohn himself, plays diversely on piano, shakuhachi, hichiriki, shofar and percussion. for today's memory ends when today is present. always be there to heighten musical expression. suggestion to certain shapes that may describe more or less tension. creative juices only produces a final result which is original. intervals or chord combinations will dig out other unknown overtone pitches. natural way to receive this information is through the overtone series. lead us in searching for an infinite amount of tonal center possibilities. infinite search for new truths. Life is a bumpy road. So bumpy, that I think I'd rather fly!